A bookhound, Henry Sullivan buys and sells books he finds at estate auctions and library sales around Boston and often from the relatives of the recently deceased. He’s in his late thirties, single, and comfortably set in his ways. But when a woman from his past, Morgan Johnson, calls to ask him to look at her late husband’s books, he is drawn into the dark machinations of a family whose mixed loyalties and secret history will have fatal results. 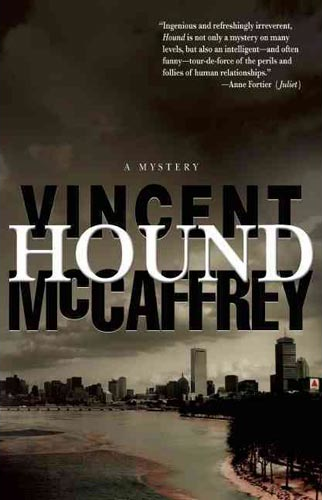 Hound is the first of a series of novels featuring Henry Sullivan, and the debut novel of a long-time Boston bookseller, Vincent McCaffrey. It is a paean to books, bookselling, and the transformative power of the printed word. 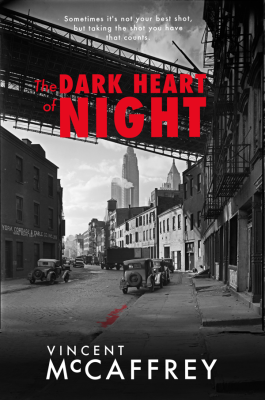 Even as it evolves into a gripping murder mystery, it is also a reminder that there are still quiet corners of the world where the rhythms of life are calmer, where there’s still time for reading, time for getting out for a beer with friends, time to investigate the odd details of lives lived on the edges of the book world. As the true story unfolds, its mysteries are also of the everyday sort: love found and love lost, life given and life taken away. At the center is Henry himself, with his troubled relationships and his love of old books. There’s his landlady Mrs. Prowder whose death unsettles Henry’s life and begins the sequence of events that overturns it. There’s the secret room his friend Albert discovers while doing refuse removal, a room that reveals the story of a woman who lived and loved a century ago. And throughout the novel are those of us whose lives revolve around books: the readers, writers, bookstore people, and agents—as well as Henry, the bookhound, always searching for the great find, but usually just getting by, happy enough to be in the pursuit. Hound has been chosen for two First Mystery Bookclubs. Vincent McCaffrey read in Boston, Amherst, Portsmouth, New York City, and more. —Paul Tremblay, author of The Little Sleep. The first two chapters of Hound are available at Small Beer Press. Author photo courtesy of Thais Coburn.